Special fast track design, close tolerances eliminated adjustment mechanism. Three spindle cluster module for an outdoor power equipment manufacturer’s engine transfer line. On time delivery and tolerances for spindle centerline location within the work envelope were critical issues for this job. Another important factor was the customer’s desire to use special tooling with the units. 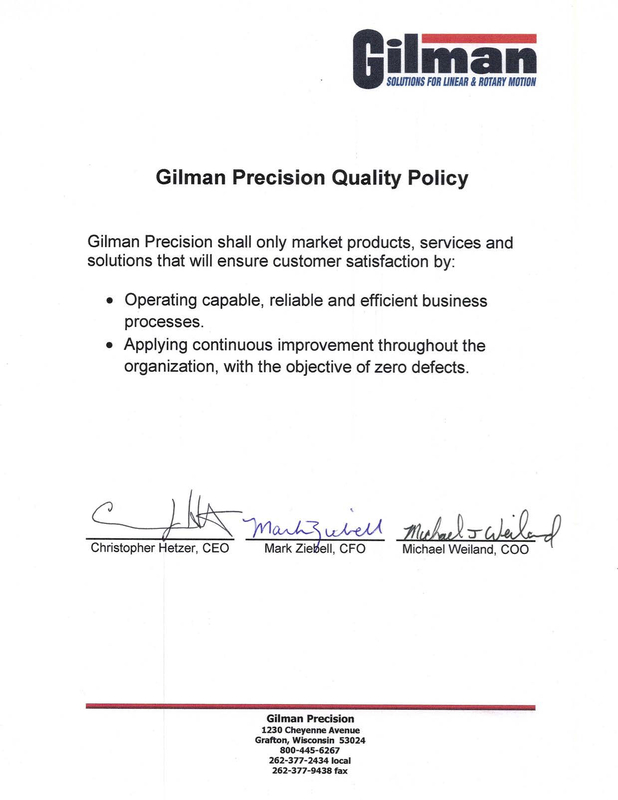 Gilman Precision worked closely with the customer to establish and meet the necessary delivery date. In fact, Gilman was able to ship a few days earlier than the required date. This timing was noteworthy, considering the special spindle shafts necessary to accommodate the customer’s desired tooling. The issue of spindle-tospindle centerline location tolerances was where Gilman’s commitment to the best in manufacturing technology allowed a finished product that exceeded the customer’s expectations. Originally, the design called for adjustments to be built into the assembly that would allow on-site “steering” of the three spindle centerlines to keep their relative location in spec. The SIP Jig Borer allowed such accurate bore location that the requirements for “steering” adjustments were dropped from the design specifications by the customer. 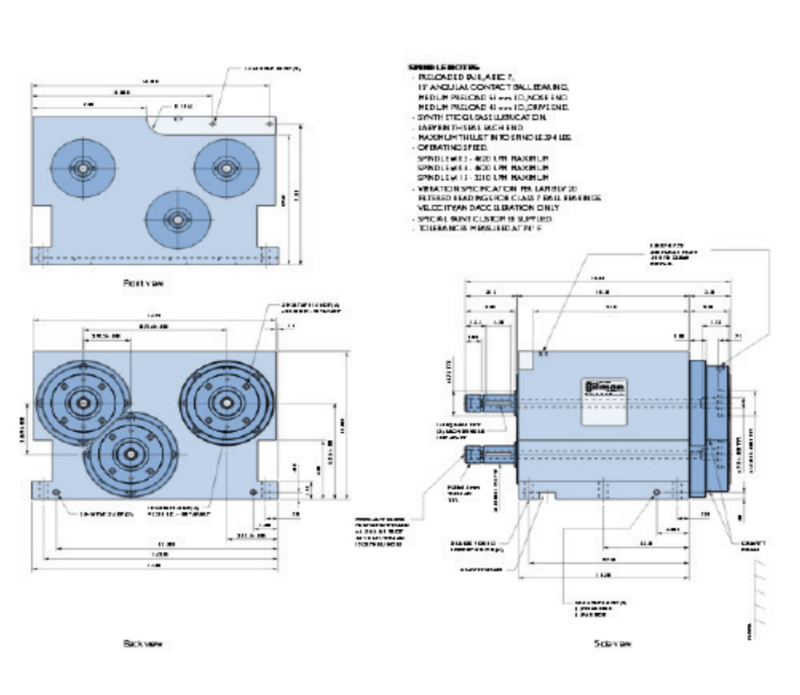 Of the original bore location specifications of .0005”. Gilman Precision’s actual test results of the complete assemblies showed bore locations accurate to within .0002”. 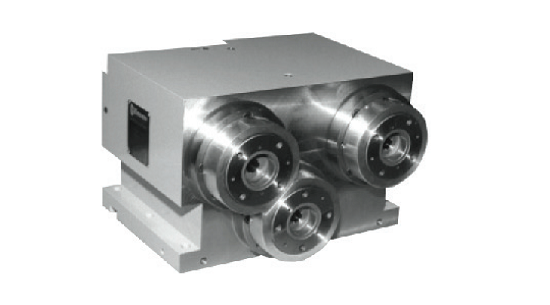 The cluster spindle modules were mounted on Gilman Hardened Way slide assemblies. The slides were driven by hydraulic cylinders. The three spindle cluster module was designed for one of six stations on a dial-type machine. The three spindles are belt driven from the rear. Two spindles operate at 4,620 RPM and one spindle operates at 2,310 RPM. The spindles are positioned to machine three areas of a casting for an outdoor power equipment engine part. The spindles are based on a Gilman 4000C -X2M-SBM spindle with 55mm bearings at the nose and 45mm bearings at the drive end. The bearings are medium preload ABEC 7, 15° angular contact units. Synthetic grease lubrication and labyrinth seals are used. Air purge provisions are designed into both the front and drive ends of the spindles with fittings on the assembly housing. Coolant unions allow coolant through the tooling.